Expanse has a powerful Mod Matrix, but you may be wondering, where is Scale like I’ve used on other synths? Don’t worry, scaling is possible in Expanse, it’s actually quite easy. In this tutorial, we’ll use the example of scaling modulation from an LFO by the Mod Wheel. The LFO may be modulating pitch or filter cutoff for example, here we’ll use pitch. 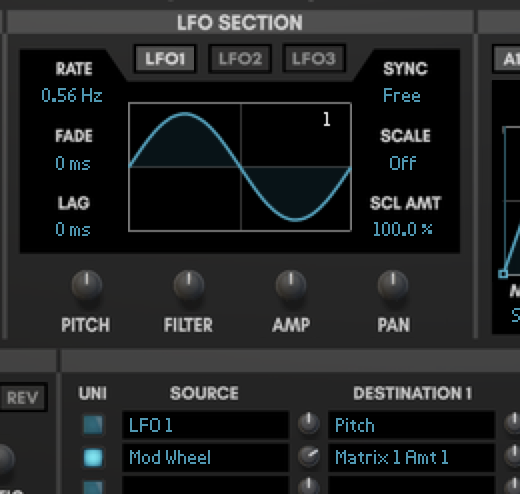 Scaling an LFO with the Mod Wheel is so common that there are actually numerous ways to do it with Expanse. It’s best to know how they all work so you can pick whichever way flows best for you. First let’s set up pitch modulation using LFO 1. Just use the target knob for Pitch on the LFO to apply some modulation. Now for scaling technique #1. The LFOs and envelopes have their own scaling settings. Change the scale setting to Mod Wheel. That’s it! It’s now scaled. For scaling technique #2, we will set up modulation in the Mod Matrix. Use Reset Device to clear the settings. We’re going to route LFO 1 to the Pitch destination. 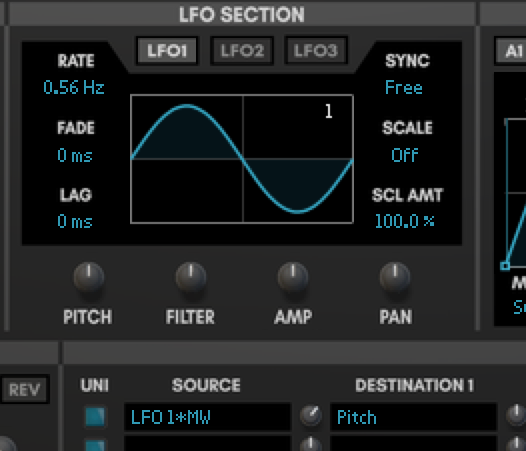 Choose “LFO 1 Scaled” for the source so that the scaling from the LFO’s internal scaling settings is applied. 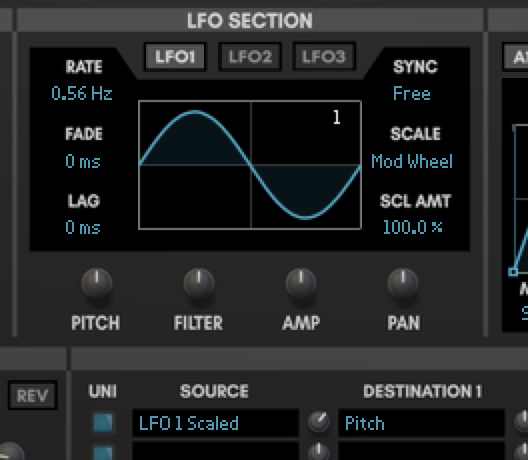 Like before, change the scale setting for the LFO to Mod Wheel. You can used the “Scaled” sources for both LFOs and envelopes. This now should sound the same as technique #1. In some cases you may want 100% scaling from the Mod Wheel and don’t care about the option of less scaling. There are settings in the Mod Matrix for 100% scaling of several sources: Mod Wheel, Aftertouch, and Velocity. They are represented by multiplication, for example “MW*LFO 1”. 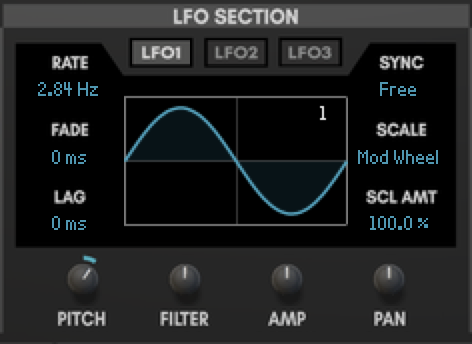 Instead of using the scaling settings for the LFO, lets just choose “MW*LFO 1” as the source. Using these multiplied sources is scaling technique #3. Scaling technique #4, the final technique, is the most flexible and will take care of all your advanced scaling needs. There are Mod Matrix destinations for each of the destination amounts. To set up the exact same modulation as before, we route LFO 1 to Pitch, but leave the amount at zero. This time choose “LFO 1”, which has no built-in scaling. Then route Mod Wheel to Matrix 1 Amt 1. The Mod Wheel will modify the Row 1 Destination 1 amount. Enable Unipolar for the Mod Wheel source, that means it won’t change anything when it is at zero. As you turn up the mod wheel, it will turn up the Row 1 Destination 1 amount. This will effectively create the same scaling we set up in the previous techniques. These four techniques offer you flexibility when it comes to modulation scaling. There’s no right or wrong way to do it. Keep them in your bag of tricks and incorporate them into your workflow as needed. Happy scaling!